After 8 months of exercising to bake bread in the a wood fired oven, I finally arrived to have a good looking bread. I have tried many options in my desire to reach to a bread that is opening its heart to me. I was close sometimes but far from having a perfect good looking bread. 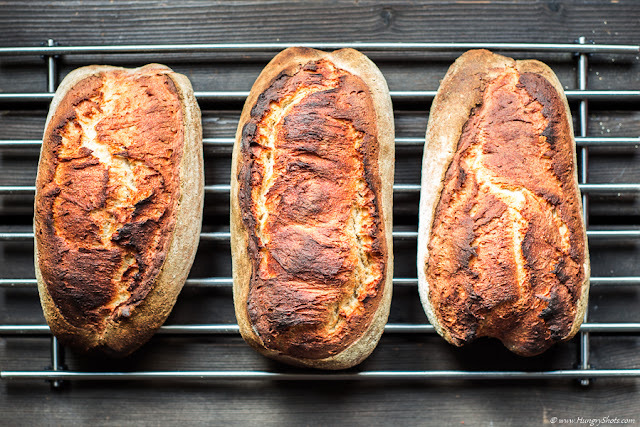 Each time, the breads were eaten completely and never thrown away no matter how good looking they were. When I bought the wood fired oven I expected to be a bit more difficult to bake bread but 8 months seemed ridiculously long. I've had all kind of experiences: overbaked breads, burned breads, dried breads, underbaked breads, flat breads strange shaped breads and I may say that each bread is a challenge in itself. How I reached to have this one? Well ... I do not know exactly as my lately breads were quite similar. I guess that the durum flour had some magic in achieving this. I hope I am able to reproduce the same results with other types of breads as well, but we shall see. Day 1: 18:30 Mix all ingredients using a standing mixer.for 15 minutes. Day 1, 18:45, cover the bowl with lid and put the bowl outside, at winter temperatures 5-10ºC. If the weather outside is colder or warmer than that, use the fridge that usually is around 4ºC. Day 2, 8:00AM, bring the bowl with the dough inside and keep it in a warm place inside your house. Day 2, 10:00AM, remove the dough from the bowl and put in on a board. Divide and shape 3 oblong loaves and place them in 3 floured bannetons. Day 2, 10:15AM Do the final fermentation, by letting the loaves covered with a linen towel to raise nicely before the bake. Day 2, 13:00, reverse the bannetons on a pizza peel and score the breads with a sharp blade. 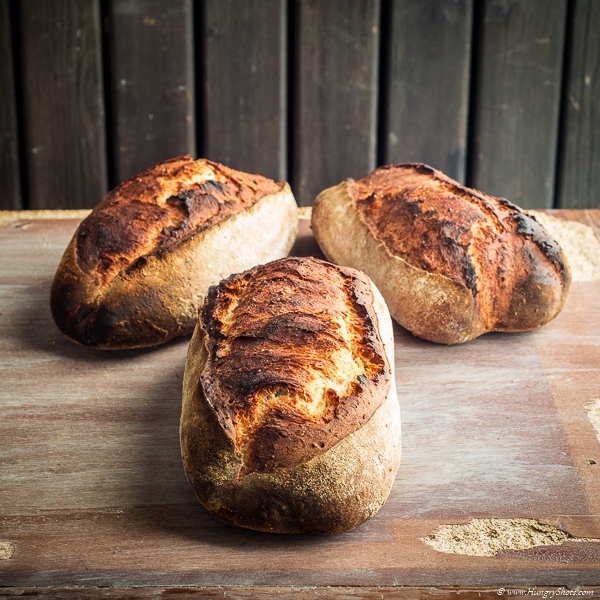 Slide the breads into the hot wood fired oven (~300ºC) and bake for 25 minutes. You may check if the breads are uniformly cooked at half of the interval and if not, rotate them in the oven and keep them for 10 minutes more.